Worth/Defence presents text-to-speech dialogue between an arguing couple over fish being gutted and filleted. 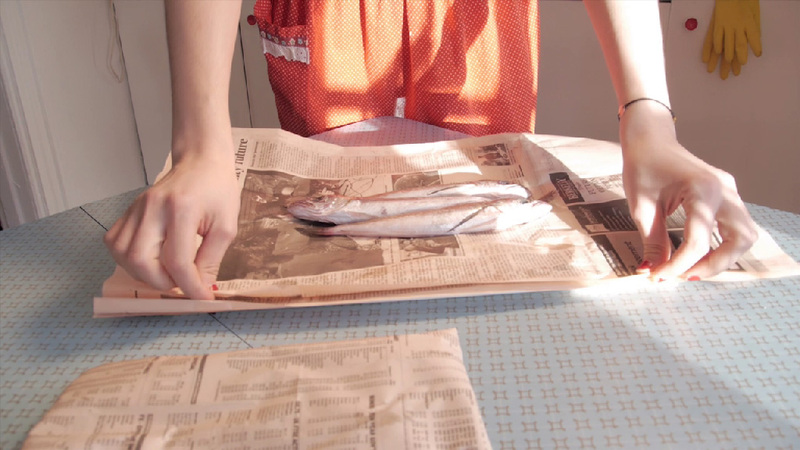 Six mackerels are filleted by a woman and one striped bass is gutted by a man. Neither butcher is practiced, insinuating the thoughtless confrontations couples have that stem largely from self-defence. The emotional butchery that lovers inflict upon one another is blatantly represented by the bloody fish. The question of worth often comes up in love: weighing the good against the bad. Is it worth staying in a relationship if it tends towards bickering and arguments? If defensiveness is taken out of the equation, worth is somehow gleaned from love, though this is a difficult task – hinted at by the gruesome imagery. 2015 April Academy of Video Art Gala. Screening. Nominated for Best Short. Montreal, QC. This entry was posted in Video on 21st February 2014 by kaja.